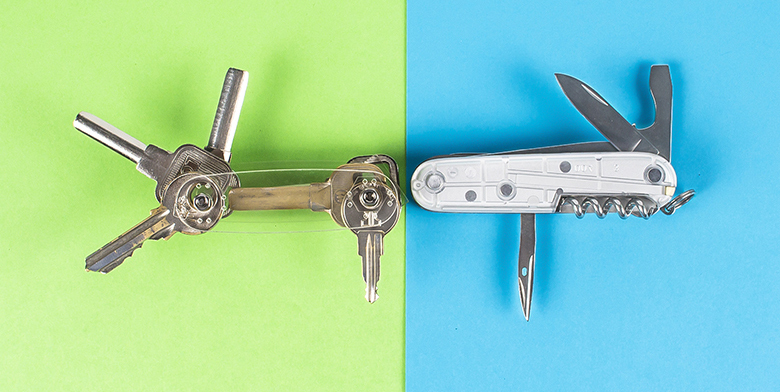 If you have these questions, you just need this blog - to make an army key! No further ado, let's begin! Since I use the round-head M3 screws (5.5mm head), it sinks through the hole on the thigh plate. So I use two washers. Tips: Here I use some acrylic washers. If you don't have these, you can make them with a thick cardboard or cuttable plastic board . Then cut the board based on the holes' size on the thigh and the keys. It doesn't matter whether to put which on which. But remember the washer should be almost as thick as the key. 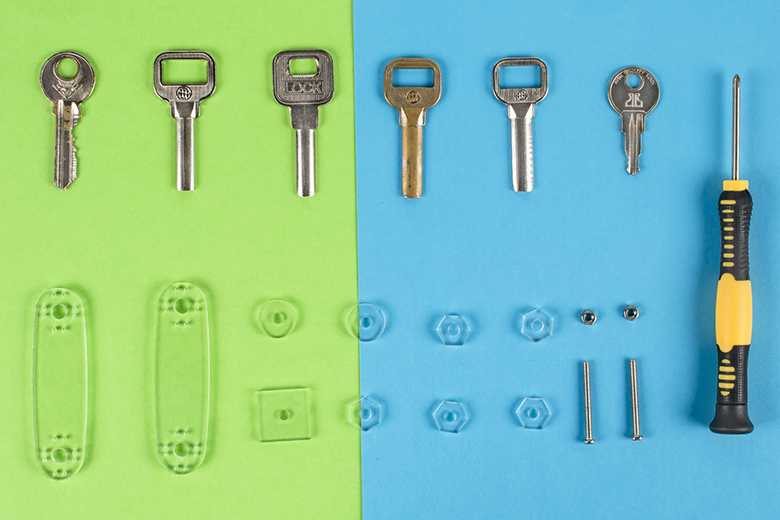 Place a key and a washer alternately into both screws. Note: When placing the key, pay attention to the hole on the key and the washer's size. Tips: Keys into one screw should be nearly as thick as those into the other, which would make it most convenient to rotate out the keys on two sides. After putting the thigh, fix them with two M3 nuts. Remember to screw a little first, and arrange the keys and washers well - one key on a screw, one washer on the other in a same level. P.S. : How to make these two cover boards if I don't have the SunFounder robot's thigh? Prepare a hard and thick board - better use wood, plastic, polystyrene (EPS) board, polycarbonate sheet or other materials than paper in case of getting wet and soft. Or if you have access to a 3D-printer, you make design and make one. If you really need to use paper cardboards, find one with water-proof film. I've uploaded a file for this thigh plate and you can download the photo to draw/print your own. 1. I just happen to have a disused box and I've printed the thigh plate on a piece of paper (plate in actual size: 73*21mm). 2. Cut the plate's shape out and press it on the box board. 3. Draw along the outline and cut it out. 4. Pay attention to the holes at two ends - you can drill or punch a hole with a drill or knife or just a screwdriver, and the diameter would depend on the screw size you use. P.S. 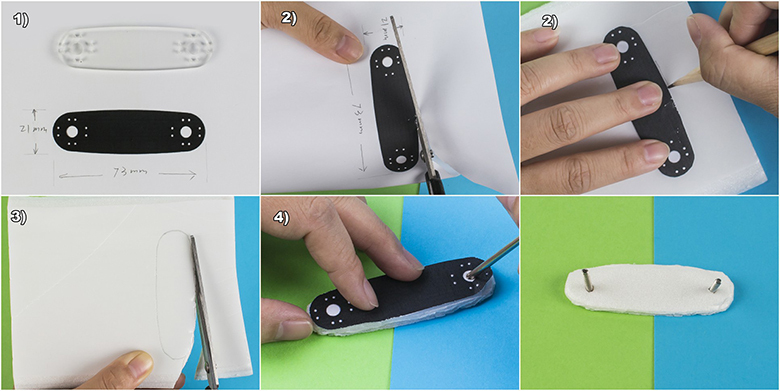 : How to cut the cardboard for washer? Put the key onto the card, mark the edge with pencil. Cut the washer out based on the mark. 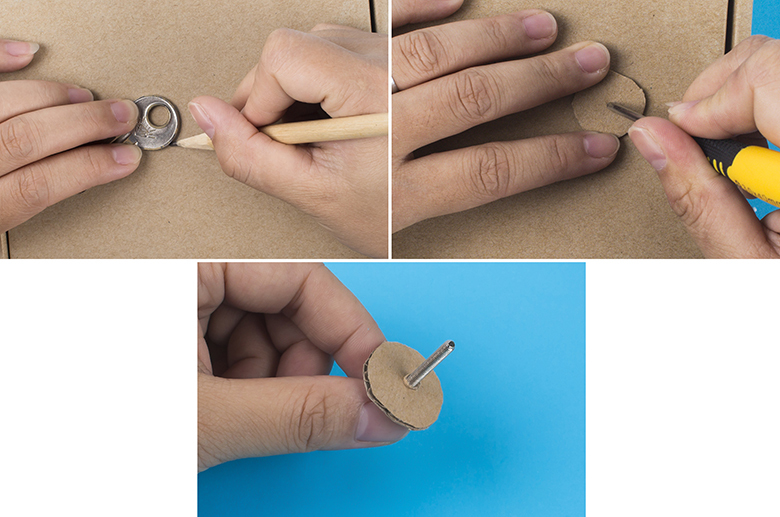 Drill/Cut a hole in the middle, diameter a little larger than the screw size 3mm. Cut more for sufficient thickness. P.P.S. : Thanks for our customer Seth C who had uploaded his works http://imgur.com/xHbfE2E on our Forum. Thus we are inspired to make this project for all of you. Enjoy!